The number of Victorian children undergoing general anaesthetic to remove decaying baby teeth is increasing, new figures show. 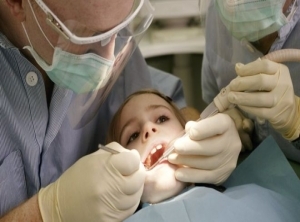 A growing number of Victorian children are being put under general anaesthetic to have rotten teeth pulled, in a trend linked to high-sugar diets and poor dental care. Data obtained by the Australian Dental Association Victorian Branch shows more than 2200 children aged nine and under needed general anaesthetic in 2017/18, an increase of 13 per cent over the previous 12 months, and 39 per cent since 2013/14. "It really points to the severity of the problem at a young age - the prevalence of tooth decay at a young age is worsening," branch chief executive Matthew Hopcraft said. "We're seeing two-to-three-year-olds who can't be treated in the dental chair. "The only way we are able to treat the kids is to put them in hospital and under a general anaesthetic which comes along with risk and is traumatic for the child and their family, it's an outcome we should be trying to avoid." More than 2900 children aged up to 17 had almost 10,200 teeth removed last financial year, with children under nine faring the worst, making up 76 per cent of cases. "The average number of teeth being removed for a zero to nine-year-old is four ... and at that age a child has 20 baby teeth," Associate Professor Hopcraft told AAP. "There are even a small number of kids who are having all their baby teeth removed." On average, children are having seven teeth treated: four extracted and three fillings, and that's the average across thousands of kids, he said. The association said tooth decay was entirely preventable, blaming excessive sugar consumption as the major factor in most cases, as well as irregular early dental attendance. More than 2.5 million Victorians are eligible for public dental care, but less than 400,000 get treatment and only 20 per cent of children are accessing public care according to the association. The association wants to see an end to sugary drink advertising and availability at children's events, better food labelling and increased public dental funding.